This is one example of foreign influences that mark Indonesia's culinary today. 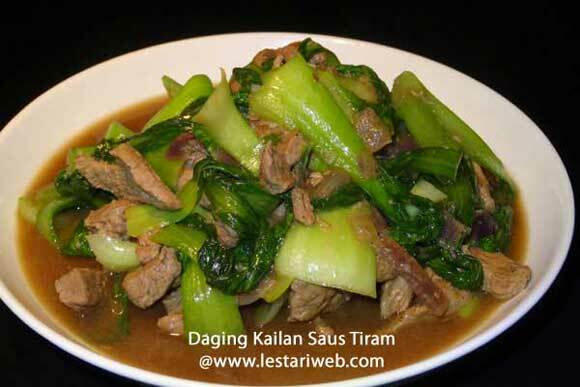 "Beef Pak Coy With Oyster Sauce" was invented by the ethnic Chinese descent who migrated to Indonesia hundred of years back, even before the Dutch came to colonize most of the Indonesian archipelago. The chinese influence has proven to win the hearts of indigenous Indonesian as well as enriched the indonesian culinary diversity. The great example among them are: Bakso, Bakmie Goreng, Bakpao and many more. 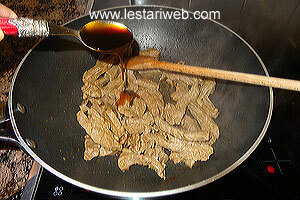 Tipp : Try to get sesame oil to obtain the best result. 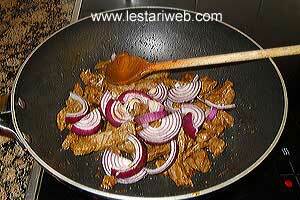 If preferred, you can replace the beef with chicken fillet or mushrooms. 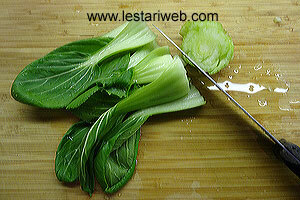 Wash the kailan, discard the bottom end. Put aside. 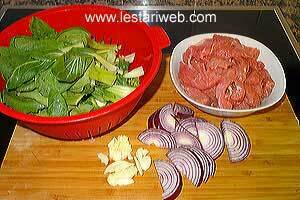 Slice the beef/minutesteak in small thinly pieces. Prepare the garlic & slice onion. Put aside. 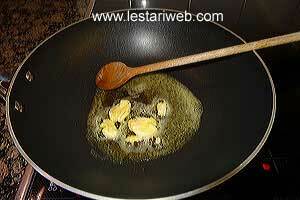 Heat 2 tbsp sesame oil / margarin in wok or frying pan, sautee the garlic until fragrant. 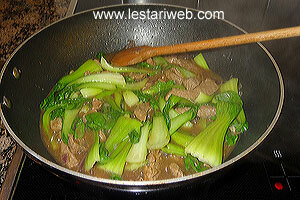 Add the beef, stir-fry over high heat until it changes colour and water begins to appear on the surface. 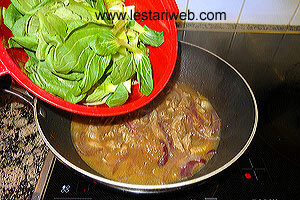 When the water is fully evaporated , add the oyster sauce & stir to mix. Add the onion, stir for a while until just wilted. 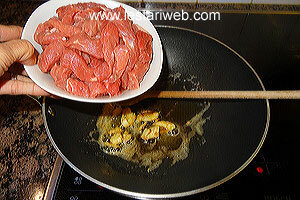 Add 500 ml hot water, cover the pan & cook over medium-high heat until the beef is tender. (approx. 15 minutes). 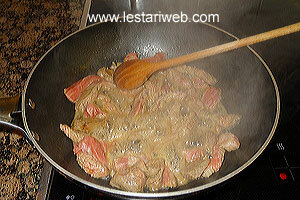 If necessary add more water if the it's driven off but the beef is not yet tender. 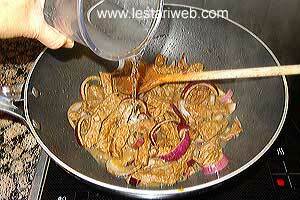 Add pepper, broth powder, stir to mix. Adjust the seasoning, add salt & sugar to taste. 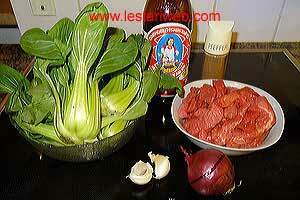 Add the kailan, cook briefly until just wilted. Remove from heat. Serve right away while hot.